An ideal stress-free workplace may not be realistically or economically achievable in the high stress world of construction, but a focus on stressors that can reasonably be targeted and reduced might have a beneficial impact for everyone. It's taken the best part of half-a-century - 40 years since the advent of the Health and Safety at Work Regulations - for construction to get to a place where safety at work is an expectation and a top priority. But, even though the industry can apply lessons learned from the advances made with safety culture to improve health and wellbeing, it can't afford to take half as long to apply the same zero-tolerance standards to safety's poor relations. With increasing numbers of construction workers suffering from workplace anxiety and stress, there is a pressing need for an industry-wide mind shift when it comes to mental health issues. The very nature of the industry is relentless, with everyone working under stress day in day out, largely driven by the pressure of working on small margins i.e. where projects are not making money the pressure on those involved is very high. And while people can cope generally with short periods of stress, it’s the relentlessness that grinds you down over time. 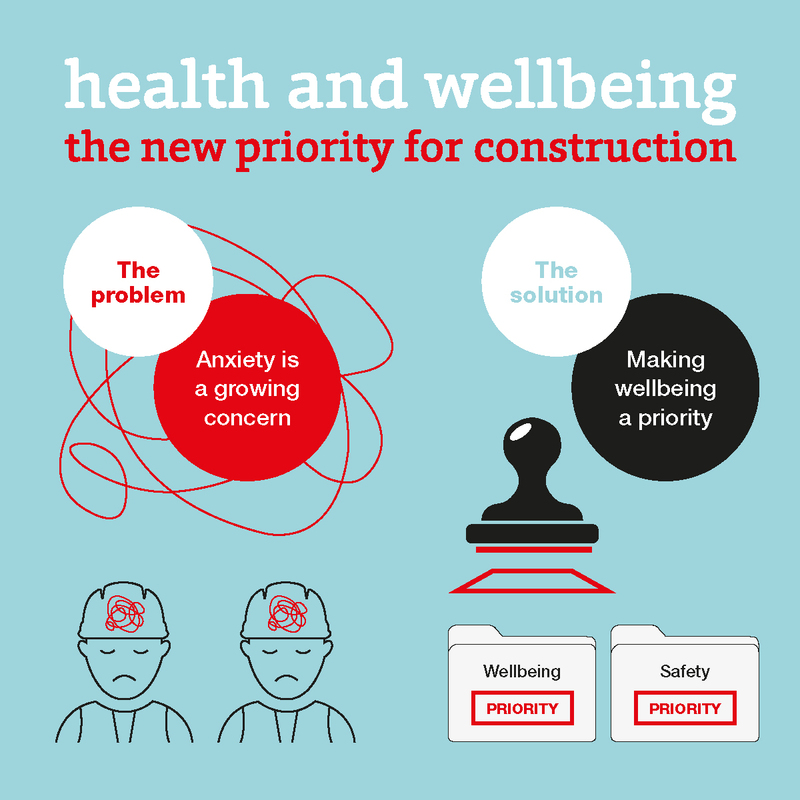 This coupled with an industry wide perception that if you are not stressed, you are not busy enough, means that being stressed out - anxious or depressed - is the norm in construction. Another example of this anti-wellbeing culture is that the early start and late finish is still seen as the mark of a good worker. In reality, doing these long days reduces the ability to be productive. Likewise, in an industry with more than its fair share of lost days through anxiety or depression, no thought is given to how 'motivational' messages such as "mental strength is required to be successful" or "when the going gets tough, the (mental) tough get going," or "safety starts with attitude," might register with those with anxiety or depression. And then there is the issue and impact of stigma to consider. Mental illness is a taboo subject, something to be embarrassed of instead of a serious medical condition that needs treating as with any other physical illness. The truth is, employees working in construction need to know that their mental health is just as important to us as their physical wellbeing. The irony is that workplace stresses can have a huge impact on safety. And while health, mental health and wellbeing are on the radar of HR and occupational health departments, the industry does not always focus on the root cause or trends for that matter. As with safety, risk assessment and management of risk for prevention is paramount. Lots of training is often given around the root cause or trends of safety risks, but that is not always the case with health, even though it is proven now that anxiety and stress leads to more absences from work than say manual handling problems, for example. It is important, therefore, that organisations not only give as much focus to the health of employees as they do to their safety, but also view the health and wellbeing of staff on the same priority level as safety policies and procedures. And it's not just about including weight management, yoga classes, refurbished restrooms, and organising flu jabs and ‘new dad packs’. Of course, things like that make people feel more valued at work, which is very important, but how employees feel about their company's operation i.e. top-down efforts to foster a more collegial and secure working environment turns out to also be important to health. Those who think that their workplace deals with employees unfairly are more prone to reporting poor health. That means, to some extent, that managers and executives may be able to help mitigate stress-related health issues, which may lead to happier and healthier workers. Things like mentorship programs to help in tackling high stress levels for employees and the associated health costs for employers, and efforts to retain employees for significant periods of time might help too, since workers tend to feel more secure and form more supportive social networks when there is some level of consistency within the employee pool. As an industry, we need to take the issues of workplace stress and mental health seriously. Managers and colleagues must be equipped to identify or manage work-related stress or mental health issues.